I signed up for Christy Tomlinson's She Art class. 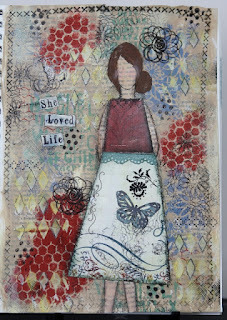 I am really loving practicing with all the mixed media stuff I bought. This is the second girl that I've done. Still lots to learn, but the experimenting continues. She seems to do her girls on canvases, but I'm doing my practising in my Art Journal. I've got some ideas of where I'd like to go with this. We'll see. Meanwhile, some of the things I'm learning about myself is I'm a reluctant stamper at present. Once I get that ink on the stamp, it's hard for me to committ. I love doing things that are movable, erasable and do overable. LOL! I'm also so not a doodler. That is going to require alot of work. However, it continues to be a good thing for me. Really out of the comfort zone on so many levels. I like the push it's giving me! Wow, Char! I'm impressed....this is WONDERFUL!! So cool that the She Art is becoming a journey of self discovery ;) Beautiful! I'm loving your projects Char!! Your on a journey of the best kind..discovering what you love to do! It's fun to step out of our comfort zones and try new things!! I told you, you would love She Art!!! Awesome page! I want to take her class now!!!! !